So many factors impact a company’s profitability from rack to retailer. Success depends on the performance of equipment and personnel every step of the way. And, the ability to optimize those assets and resources to ensure maximum performance under changing market conditions is a challenge. TMW software for fuel delivery operations can make strategic and tactical differences at every stage of downstreaming. For petroleum marketers, convenience store chains, regional fuel distributors and fuel haulers, TMW transportation management software is designed specifically for bulk fuel carriers and fuel supply chain networks offers extensive inventory management and forecasting services. The result? A streamlined approach to complex processes, maximizing asset productivity as well as providing optimal customer service. And that’s an asset to your business. We looked over dispatchers’ shoulders. We rode with drivers. 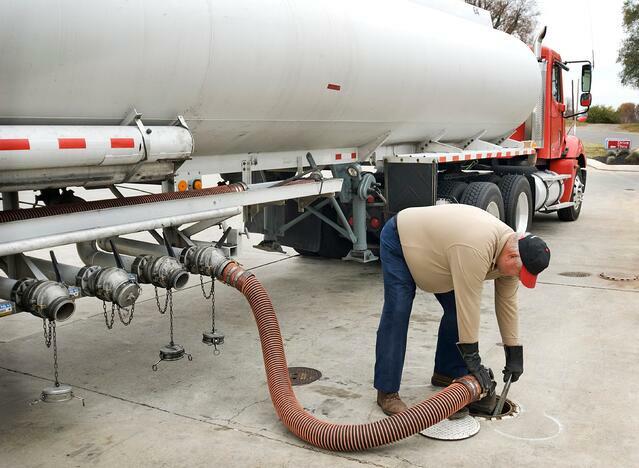 We talked with fuel distributors, fleet managers and retailers. We studied your market at ground level. And, we hired experts in your field. We went the extra mile to determine what makes your business run smoothly. Our job is to help you run it at peak efficiency. Field-level insights continue to guide us as we identify and answer emerging contingencies, shifting fuel efficiency standards, and changing practices. Deliver within time windows with the right product mix. No retains, no run-outs. Monitor fleet, station, load and driver status and performance. Plan effective and safe routes for drivers with accurate pickup and delivery information. Track pricing time sensitivity on commodities lifted for customers. Manage to right-sized in-ground station inventories. Minimize safety and environmental incidents. Respond quickly and appropriately when incidents occur. Communicate progress, alerts and service quality to customers. Integrate continuous improvement programs to reinforce positive driver behavior. TMW tools allow dispatchers to handle more site demand, drivers, and carriers. TMW provides the means to efficiently schedule loads and increase the percent of loaded miles. With order management, dispatch, driver planning to automated customer billing, TMW trucking management software streamlines fuel supply chain processes for better customer service, increased asset productivity and more accurate billing. TMW’s shift-based route scheduling gets product to stations in the required, often tight, delivery windows. Our load requirements/trip validity make sure the right assets run the trips, with drivers with the right qualifications. We reduce mistakes, risks and paperwork by electronically conveying pickup and delivery information, along with fuel relations information about pin codes and rack and commodity relationships. We increase situational awareness throughout the life of fuel trip, especially through driver mobile and web-based carrier order status communications. No matter what priorities you identify, you gain full flexibility, functionality and mobility with your TMW solution. All the data generated by your TMW trucking software --all that useful information--doesn’t reside in its own universe. It feeds into your business management systems to generate valuable reports to guide upstream decision-making. Total connectivity with your enterprise systems means you can communicate in real time with partners as well as field personnel and drivers. Built-in alerts and alarms allow you to respond quickly to avert delays. Maximize how fluid your operations flow with fuel software solutions from TMW Systems, an industry leader in all applications of transportation logistics. TMW solutions help you manage your complex business with greater control, visibility and profitability. Find out why TMW Fuel software is your best choice for oil and gas software solutions. Contact us now.